This year we’re feeling extra festive, and will be giving away some BioX swag throughout the Holidays. 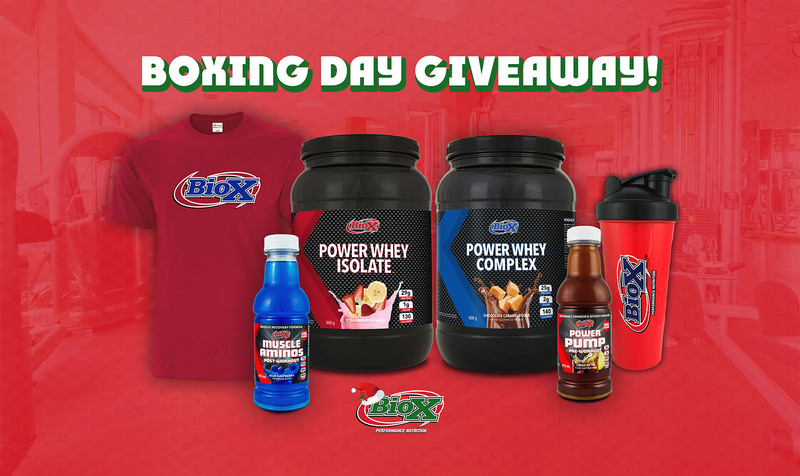 These giveaways will ultimately lead up to our massive BioX Boxing Day Giveaway. All you have to do is like us on Instagram and tune in to our Live Instagram feed on Boxing Day with the one and only @stephen_alb! 1 Power Whey Complex (908g), 1 Power Whey Isolate (908g), 1 Power Pump (Ready To Drink), 1 Muscle Amino (Ready To Drink), 1 BioX T-Shirt & A BioX Shaker Cup. So make sure you tune in on Boxing Day for your chance to win!